The well-documented observation of bilateral performance gains following unilateral motor training, a phenomenon known as cross-limb transfer, has important implications for rehabilitation. It has recently been shown that provision of a mirror image of the active hand during unilateral motor training has the capacity to enhance the efficacy of this phenomenon when compared to training without augmented visual feedback (i.e., watching the passive hand), possibly via action observation effects. 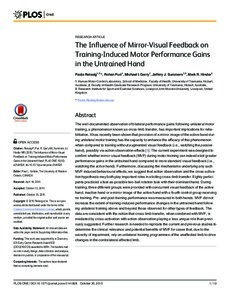 The current experiment was designed to confirm whether mirror-visual feedback (MVF) during motor training can indeed elicit greater performance gains in the untrained hand compared to more standard visual feedback (i.e., watching the active hand). Furthermore, discussing the mechanisms underlying any such MVF-induced behavioural effects, we suggest that action observation and the cross-activation hypothesis may both play important roles in eliciting cross-limb transfer. Eighty participants practiced a fast-as-possible two-ball rotation task with their dominant hand. During training, three different groups were provided with concurrent visual feedback of the active hand, inactive hand or a mirror image of the active hand with a fourth control group receiving no training. Pre- and post-training performance was measured in both hands. MVF did not increase the extent of training-induced performance changes in the untrained hand following unilateral training above and beyond those observed for other types of feedback. The data are consistent with the notion that cross-limb transfer, when combined with MVF, is mediated by cross-activation with action observation playing a less unique role than previously suggested. Further research is needed to replicate the current and previous studies to determine the clinical relevance and potential benefits of MVF for cases that, due to the severity of impairment, rely on unilateral training programmes of the unaffected limb to drive changes in the contralateral affected limb.